That’s the new Panasonic Micro Four Thirds AG-AF100 AVCCAM camcorder up there. I think Panasonic is going to make a whole of friends with this one. 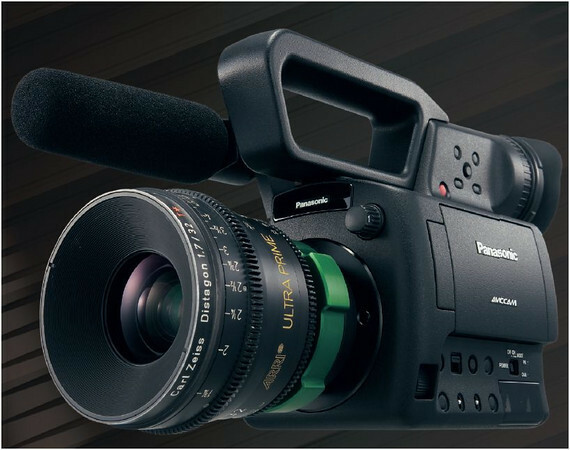 To see all the goods that were just spilled, courtesy of a product brochure from Panasonic, head on over to Tech Tilt. With overwhelming success of the Canon 5D Mark II and subsequent video-capable DSLRs, it was only a matter of time before someone broke the mold and put a DSLR-sized sensor in a true camcorder body. I suspect that Canon and Nikon are both working on a similar concept; however, it looks as if Sony may be the first one out of the gate. Along with the Panasonic G10, the Panasonic Lumix G2 is another 12.1MP Micro Four Thirds camera that follows the previous generation G1, GH1 and GF1 cameras. The G2 headline features include an articulating, 3-inch Live View LCD with a touchscreen interface, along with HD video capture in AVCHD Lite format. The G2 is paired with a 14-42mm image stabilized kit lens and, of course, is compatible with all previously introduced Micro Four Thirds Lumix G lenses from Panasonic. Additionally, the G2 includes a built-in pop-up flash and a hot shoe for external flashes. The G2 will be available in red, blue and black body colors.